Men swim in idiocy, and always have. It is only when a culture enters its declining phase that it becomes incurably decadent. Decadence can last some time, but not forever. Perhaps the article “Aristotle’s binary philosophies created today’s AI bias” by some female at Quartz, a once-respected magazine, signals we are entering the latter stages of decadence. 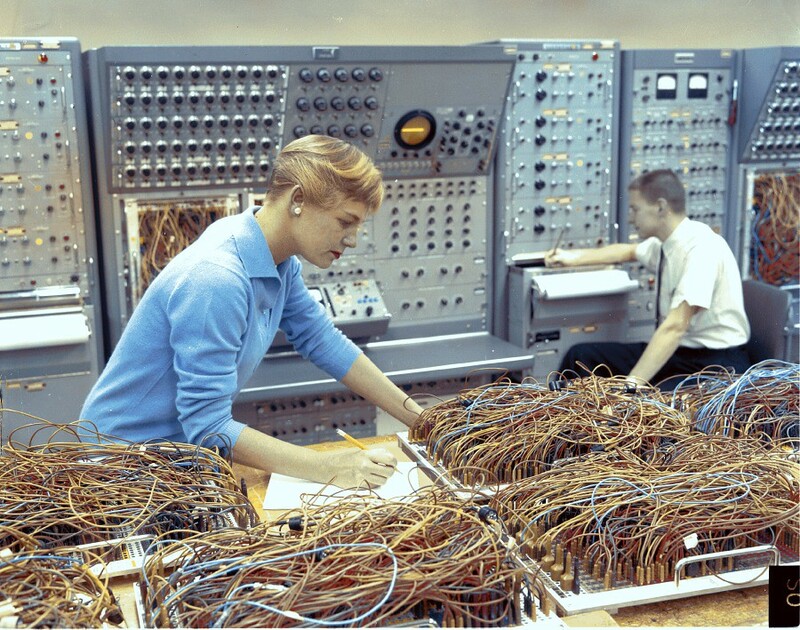 The female first notices that computers are largely based on binary numbers. “Don’t be fooled, though,” she says, “These 0s and 1s don’t mean that the machine understands the world and languages like we do.” Machines, of course, don’t understand the world, or anything, at all. There is as much understanding in a computer as there is in your can opener. Binary reduces everything to meaningless 0s and 1s, when life and intelligence operates XY in tandem. It makes it more convenient, efficient, and cost-effective for machines to read and process quantitative data, but it does this at the expense of the nuances, richness, context, dimensions, and dynamics in our languages, cultures, values, and experiences. But we shouldn’t bemoan Silicon Valley developers for the biased binary system—we should blame Aristotle. I remind readers that Aristotle was a white man. The female writer said Aristotle, the big meanie, “socially engineered a hierarchical patriarchy and divisive polarity that was rooted in his internal values and biases against others: The items he ordained to have more worth became 1s, and those of lesser importance 0s.” Of course, her internal values and biases that she seeks to impose on us are better because she is a non-male. Alas, Aristotle’s hierarchical classification system got implemented into AI, load-weighting in favor of men like him. The very system on which all modern technology is built contains the artefacts of sexism from 2,000 years ago. It appears 1s are superior because they are associated maleness, and 0s inferior because they are associated with femaleness. It did not occur to the female writer to swap the labels and thereby solve the problem. Aristotle loathed democracy, understanding it as a corruption in the body politic that always gave rise to tyranny, as anybody who has actually read him would know. He disliked it a least for the reason that females writers like ours would have a vote. It should be noted that successful software projects, even open-source ones, are not democratic. Our female writer moves from disparaging the sexism of Aristotle to that evinced by Descartes, whose mistake was to “put Aristotle’s lines of syllogistic logic into a tree structure. These tree structures are now used in NLP’s (Natural Language Processing) recurrent neural networks.” Leibniz was also judged to have not been a female. Want more evidence of the insidious patriarchy in computing? Well did you know “swipe right = 1, swipe left = 0”, and “clicking ‘like’ on Facebook = 1, not clicking like = 0”? Other similar horrors are cataloged. But the problem with binary logic is that it provides no scope for understanding and modeling why and how people have chosen one option over another. The machines are simply registering that people have made a choice, and there’s an outcome. We don’t classify and qualify the world around us with Aristotle’s hierarchical binary biases. But the way data is collected is black (0) and white (1), with shades of grays provided by percentages of confidence. Meanwhile, nature and Eastern philosophies show that our perceptions are whole waves of rainbow colors. Our earnest non-male writer doesn’t tell us how we can code this Eastern rainbows as substitutes for binary arithmetic. She is certain, we imagine, some lady coders will figure out a way. Nor does our non-male heroine understand that in her judging Aristotle wrong and herself right is the result of applying binary logic. I recommend not telling her, as I don’t think she could handle that knowledge. Update Some genius at github created the page “TheFeministSoftwareFoundation/ C-plus-Equality.” “The language is to be strictly inHERpreted using feminist theory. Compilation privileges a single processor architecture over all others, which is deeply problematic. We cannot FORCE a cpu to conform to any architecture…” Hilarious. How it survives the notoriously humorless admins at github is anybody’s guess. Good grief Briggs, where do you find this crap. Socrates also said, “I thank the Gods I was born a Greek not a barbarian, a free man not a slave and a man not a woman.” Best not tell the lady. Obviously this non-male writer wasn’t simply venting meritless outrage at an imaginary injustice created by a projected gender identity assigned to the numbers 1 and 0… that would imply shallowness and deluded paranoia reminiscent of radical feminism… clearly she was must have been offering an intellectually rigorous set up to a future article on quantum computing… where 0s and 1s have no real meaning. I wonder what this moron would about Ternary? Ternary was an early competitor to binary, and uses 1,0,-1. Ternary is more efficient. Binary won out because the technology to properly implement ternary did not exist. Notice how she also reduces philosophy to a binary..the bad western ones, and the good eastern ones? High comedy indeed. Obviously (to a man, anyway) you can encode damn near anything with enough bits, and manipulate it with the right algorithm. Data types other than Boolean are now in common use. But how do you get the user to input their hopes, dreams, and motives into a touch screen? Easy: Gain access to their Facebook and Amazon histories. The American communicates its emotional state by buying, much as the octopus changes his colors. The trouble is, of course, that real data so rarely aligns with progressive truth. But she’ll never need to worry about that problem. She’ll never know how many brave men at Google man the ramparts against that threat. More likely, she’s waiting for men coders to figure it out, who’ll then hire some affirmative action girls to flounder around and spend days writing confused code that some man will later rewrite over his lunch break. Just like the affirmative action girls of our present benighted age. They do it because they “think” with their emotions the same way this broad does. It’s hilarious that this poor girl never heard of quantum computing (or did she? I didn’t RTA). It’s probably not going to happen this century (if ever), but that’s fine for her purposes. Please reread her article whenever you’re inspired to enlighten us about evolution. For Robert Burns’ sake. Whole waves of color? That’s an appropriately vacuous statement from a 0. Channeling an uber-1, Wolfgang Pauli, it’s not even wrong. Anyway, there is no “color” in Nature, irrespective of some imaginary amalgam of wavy Eastern philosophies. “Color” is a result of different sensitivities to wavelength in foveal transduction cells. Color occurs in the eye. The wavelengths of visible radiation are no more different in “color” than the radio waves on the AM and FM radio bands. Interesting fact for Ms 0: the popular images from the Hobble (née Hubble) Telescope are “colorized” by NASA to make them interesting. C’mon, Briggs. Labeling ‘0’ or ‘1’ is numeriphobic. A value should be called whatever it wants to be called. It’s all about feelings. Diversity demands it. There is as much understanding in a computer as there is in your can opener. My can opener is smart. Only cuts can lids and not me. Cutting me would be detrimental to its well being and it knows it. The Summerians invented zero about 5,000 years ago. The idea was passed on to the Babylonians, Indians, and eventually the Greeks. The lady’s grievance identified the wrong target. It was those cuneiform guys (or gals?) who are to blame. Anyone who anthropomorphs digits has a screw loose. Oddly, she see’s herself as a zero and men are the ones. Something envy? When I was a little kid (true story), delving into decimal numbers, for some reason (known only to a three or four year old), I assigned gender to ‘4’ and ‘5’. Today, I can only guess that ‘4’ was male and ‘5’ was female, I have no other memory other than I had done this, no other explanation of why I had done this, the numbers 4 and 5, and only a vague recollection of the gender assignment. Women will destroy society. I suspect it happened in the past and the evidence was destroyed. Anyway, they will go till nothing is left, so thanks ladies for your destructive nature and inability to reign in the hate and anger you feel apparently all the time. Talk about toxic….. Yes, but if they had then they would have had an Alexandria Ocasio-Cortez back then. She is the poster girl for the modern state run school system. She has a diploma from a well known university but is as dumb as a box of bricks. I am reminded of the Scarecrow in The Wizard of Oz where the fake wizard tells the Scarecrow that he can’t give him a brain, but he can give him a diploma. The Simgularity is upon us, humans are now officially more stupid than AI’s. Computers use the binary system because it makes the electronics much simpler. No other reason. Folks, I realize that you are all having fun with this, but Twain Liu is ‘herself’ an AI program. With that thought in mind, go back and re-read the article. Obvious, right? We use a binary representation because it means that mechanical, thermionic valve or advanced semiconductor matrix. We only have to process ‘on’ or ‘off’. If we do enough work we can use those switch positions to represent almost anything given that we have a device that can process our representation. For example we can represent and store music digitally, but need an Analogue digital converter, amplifier and speakers to play it back. Decimal based systems were tried and abandoned as being horrible to engineer. Previous Previous post: What’s With The Sudden Push Against Meat?